On my recent walks down the street with Tetley, these leaching-chlorophyl leaves have been catching my eye. There’s something poignant about the luminous, x-ray quality to them, certainly an image of fading life. The ribs of the leaf are evocative of skeletons and veins, don’t you think? And then there’s this one, ravaged by chomping insects, weather, time. I find them beautiful – for me, they capture the way Summer’s has slipped away this year, slowly blurring like a watercolor into Fall. Recent weeks of high temperatures, crystalline skies, exquisitely drawing out the sweetness of last days. Summer remains my preferred season and I am sad to see it go. I like the heat, the extra hours of light, the generally slower pace. Of course Autumn brings wonderful gifts. It’s time to start transitioning into warmer garb, closing windows, stiff from being in the open position for months. The crazy chorus of night insects has diminished to only a few, forlornly calling from the dark hedges. Darker earlier these days – and that’s even before our biannual messing around with clocks. While I’m loathe to put on socks again, or find gloves that match, I’ll welcome fires in the fireplace, the deliciousness of being inside after the exhilaration of a walk in the bracing cold. I’ll appreciate the new views of the sky as the leaves hit the ground, easier to spot my favorite falcons that hunt in the neighborhood. 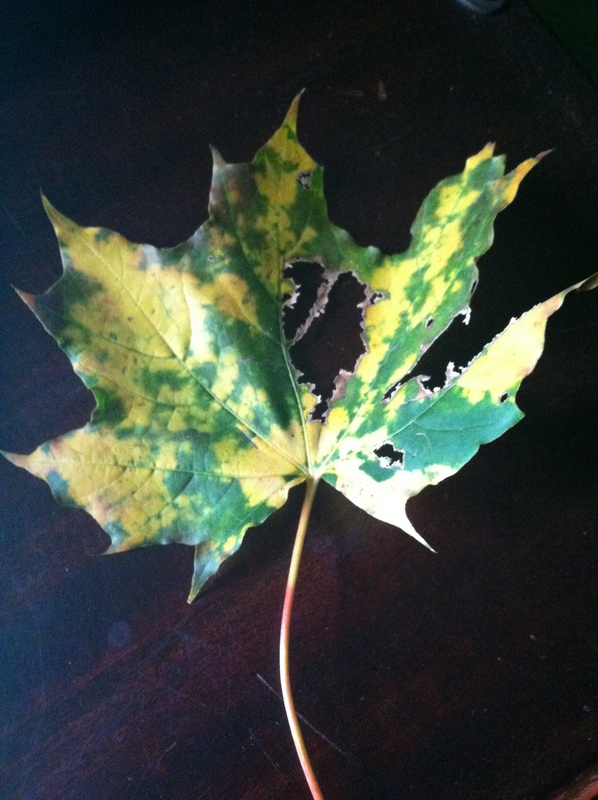 On the street where I walk Tetley, at least for now, colors seem to just be leaking, fading away. 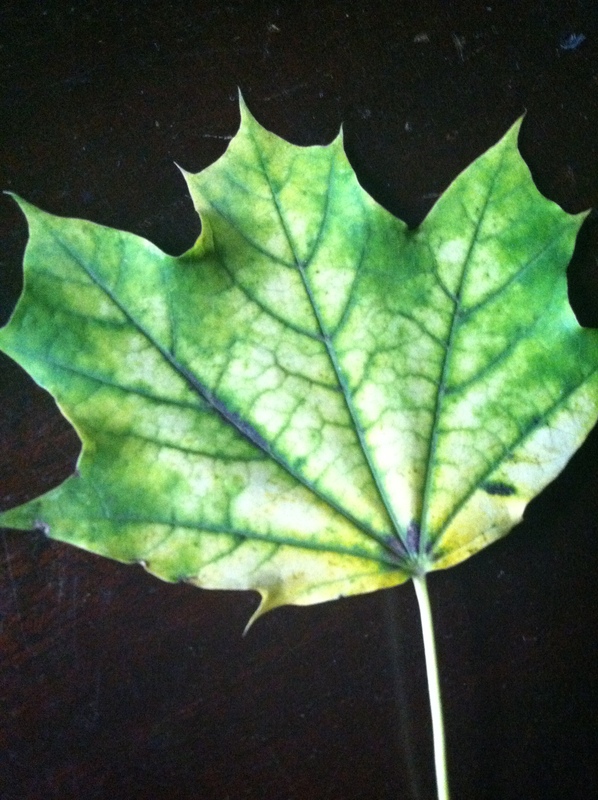 But in my yard there is a Maple going out in expected glory. 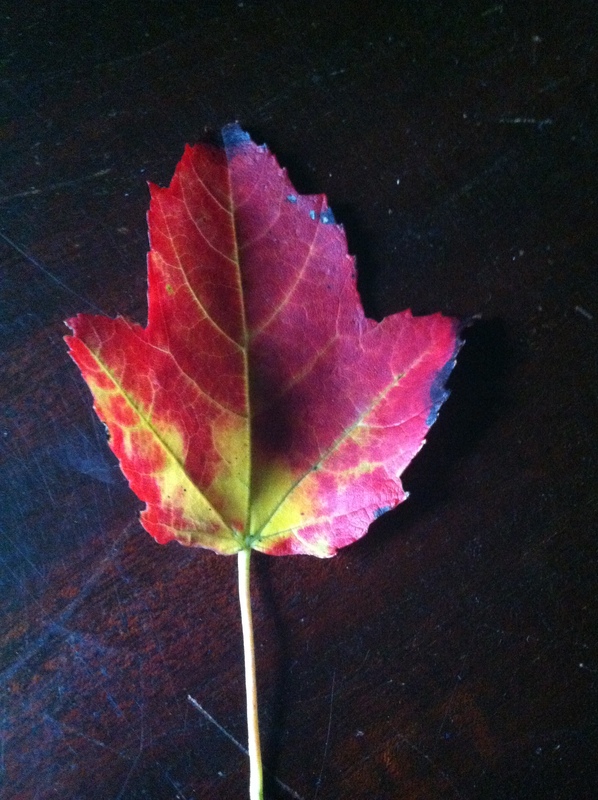 In the Camellia plant still perched outside, I find Maple leaves snagged in the branches, flashes of red. There are different exits to the end. This entry was posted in Seasonal Musings and tagged Autumn, birds, garden, light, nature, neighborhood, seasons, Summer, time, walks. Bookmark the permalink. Hmm… I hadn’t thought of that. I am trying not to be too much of a collector these days, (although I cannot resist more books!) so probably not.